Hope you had a great Thanksgiving. And though Thanksgiving is past, I do want to express my gratitude for the support of my clients, fans, and friends this past year. Your support and business allows me to continue doing what I love! And I'm really excited to announce an event that's coming up in the New Year. I'll be presenting a special "nightclub" version of my one man stage show, The ART of Magic on Saturday, January 21 at Cherry Street Restaurant and Bar in Galesburg. If you've never experienced my award winning stage performance, this is a rare opportunity to have an "unforgettable evening of magic, mystery, music, mirth, and fun sure to bend your mind, warm your heart, and tickle your funny bone." And if you have seen it before, you know this is not to be missed! I don't perform this show at a venue that's open to the public all that often, so this is a real treat for magic lovers. And YES! Tickets to this show make an absolutely fabulous and unique gift for that "hard to buy for" person on your holiday list. Why not give the gift of magic? To learn more, or order tickets, GO HERE NOW! I've been having a blast doing my tableside close up magic at Cherry Street on Saturday nights (stop by some evening if you want to see my close up magic), and I'm really looking forward to presenting my stage show in this fun venue. And if Bartonville is closer to home, don't forget I'll be there next week on December 7, for my monthly appearance at Tyroni's. Here's a short but helpful article on planning corporate holiday parties when you've gotten a late start on it... something that seems much more common these days: article. and stay tuned for more last minute additions to my schedule. Is that a narcissistic headline, or what? Actually I'm referring to a new (to me, at least) social media platform that integrates all your others across the web, and it's called about.me. Here's my brand new About.Me profile page. From what I can tell, about.me seems to be especially well suited for artists, performers, and other creative types. I'm Back at Tyroni's Tonight! Last month Tyroni's was closed for vacation the first Wednesday, so if you missed me then, tonight's your chance. From 5:30 to 8 PM. Hope to see lots of you there! Just a quick note for anyone who was planning to come see me at Tyroni's in Bartonville this Wednesday: Tyroni's is closed for vacation this week, so I won't be there this month. I'll see you the first Wednesday in September (the 7th). In the meantime, if you just can't wait for your magic fix, feel free to stop by and see me at Cherry Street Restaurant and Bar in Galesburg. I'm there most Saturday nights from 7:30 to 10 pm. As of this writing I do have an outside booking for August 27, but I'll still be able to be at Cherry Street that night too, just a little later than normal. If you have questions about my schedule, don't hesitate to get in touch: by phone: 309-647-3692 or by email. Just found out that I've been given the "Preferred Vendor" award on MyPartyPlanner.com. Well I've had a strange couple of weeks... A couple of weeks ago, on the way to a show, I had some serious car problems which resulted in my car overheating to the point that the engine was fried. So I've been car shopping the past couple of weeks (haven't found quite what I want just yet) and dealing with "transportation issues". Then last week, I was out on my bicycle running a few errands, and my bike and I fell down... Hard... Going really fast... On hard pavement... Ouch. Banged up, and scraped up, my arm pretty badly, but luckily not so much that I'm not functional. I guess sometimes you just need a few reminders to pay attention, be patient, and go with the flow. My friend, Andrew, likes to remind me to discern the difference between a "problem" and an "inconvenience". He claims that whenever he's tempted to start feeling sorry for himself and thinking he has a "problem", a little voice pops up and says, "This isn't a problem. You want to see a real problem?" No thanks! Reminders. Valuable lessons. Gotta love that. Anyway, I'm healing... my arm and my pocketbook. Hey, feel free to come out and see me this Saturday evening at the Mt. Pulaski 175th Celebration in Mt. Pulaski, Illinois. Should be a fun time. This Saturday, I'm performing at the East Peoria Relay For Life at Eastside Center. I'm doing strolling magic from 2--3:30, and a stage show at 4pm. That night (as well as the following Saturday), I'll also be at my regular gig at Cherry Street Restaurant and Bar in Galesburg. On June 25, I'm scheduled to appear at Duryea Days at Tower Park in Peoria Heights. And the following week, on July 2, I'll be performing at the Mt. Pulaski 175th Anniversary Celebration in Mt. Pulaski. Hope to see you at one of these... Call me (309-647-3692) or send an email if you have questions. I almost forgot to write about this, but last Thursday I attended a meeting at the Peoria Art Guild hosted by the Peoria Area Convention and Visitors Bureau with various members of the central Illinois arts community. The PACVB was wanting to brainstorm with the arts organizations and local artists on how we can all work together to use the arts and arts attractions to help better promote tourism to the central Illinois area. This is something I've been strongly advocating for a long time, and I'm encouraged by the new openness to making this happen. As you'll know if you follow any of my work, I'm a huge proponent of both the arts and of leveraging the power of the arts to help drive the economy, tourism, education, and many other important areas of our society. I truly believe the arts, culture, and yes, entertainment, are a driving force and a foundation of progress and vitality in all these areas. So it's great to see this new opportunity in the Peoria area, and I'm looking forward to working with the rest of the arts community to take full advantage of it. For those of you who follow my posts, you'll know that I'm a huge advocate for the Arts. Studies show that the arts and creativity drive our economies and enhance education in profound and far reaching ways. If you want to go a bit deeper, here's a great article on a conference held last fall on The Role of the Arts in Educating America for Great Leadership and Economic Strength. There's even a link to the report that came out of the conference, which includes information on how the arts assist achievement and give a competitive edge in education, in the workplace, and even the global economy. Here's an article I just found with a list of online resources for corporate meeting and event planning. It includes innovative, web based technology for planning, video conferencing, and much more, (including an app for planning events on cruise ships!!) Some of these are ones I've mentioned before, but this is one of the most comprehensives lists I've seen. Also, be sure to check out the comments below the article, as they've listed at least one more useful resource there as well. Here's the ARTICLE. Here's an article that combines my interests in the TED conferences and the meeting and event industry. 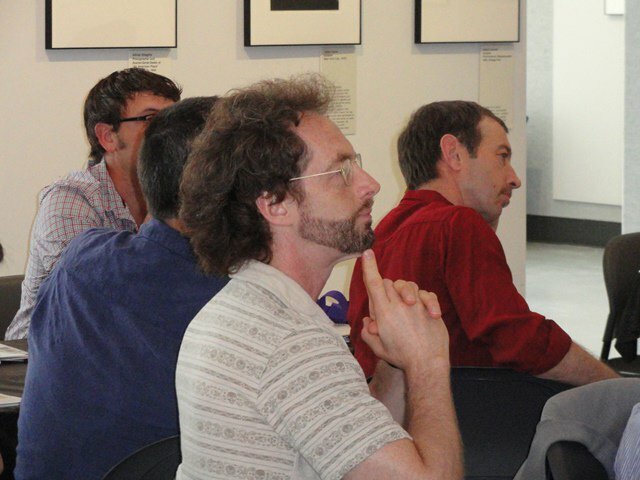 The article explores how to apply the lessons from TED to planning corporate meetings and other events. A great way to inspire creativity and innovation. Here's the ARTICLE. Well, it turns out that I'm not the only attraction with supernatural overtones at my regular Saturday night gig. Though I haven't met her yet, the Cherry Street Restaurant and Bar in Galesburg, where I currently perform on Saturday nights, reportedly has a ghost named Roxanne as a resident. Here's a recent article in the Galesburg Register-Mail. Hey! I just found out I'm the top rated magician in the Springfield area on Thumbtack.com! For those of you who have been following my work with the arts community in the Peoria area, here's an update from Arts Partners on one of the projects I've been involved with. 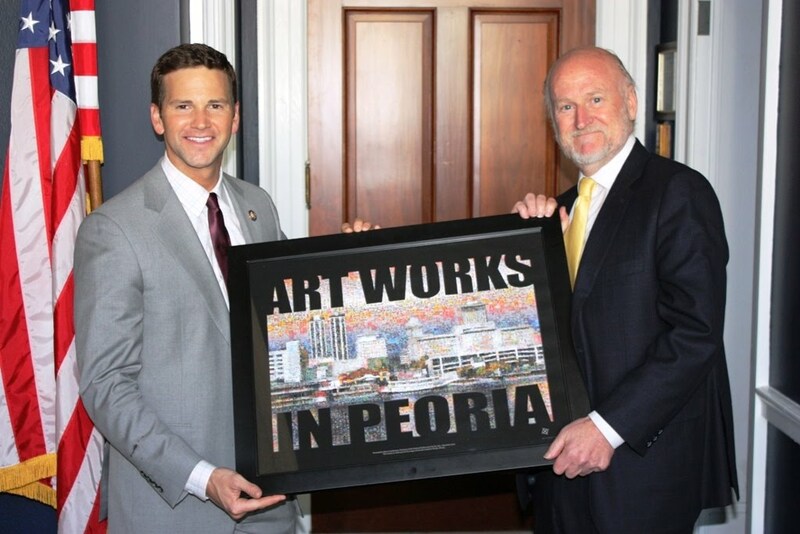 We are pleased to report that Congressman Aaron Schock presented our Art Works in Peoria poster to NEA Chairman Rocco Landesman this past week in Washington, DC. 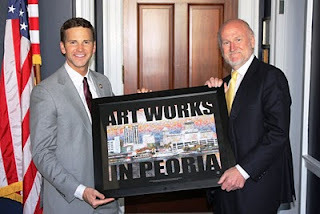 In a follow-up phone conversation with us, Rocco mentioned that he couldn’t be happier with his new poster (which is going up on the NEA walls) or with his conversation with Congressman Schock, who is a strong arts supporter and has voted in favor of maintaining funding for the NEA. Thanks again to our many local area artists who submitted over 2,700 images to comprise this mosaic image. Special thanks also go to photographer Doug Leunig for letting us use his photograph of the skyline of Peoria and to George Brown of Bradley University for creating the composite image. Here's an article on a new event planning website that sounds interesting. It launches on February 20. Here's another new article I just found on the upturn in the meeting planning industry. Could indicate good things for 2011! I have a new close up magic venue on Saturday nights. It's the Cherry Street Restaurant and Bar in Galesburg, where I'm doing my strolling, tableside sleight of hand magic on Saturdays from 7:00 to 9:30 PM. It's a really fun place, and the owners, Lou and Stan Devlin are the nicest people imaginable, and they make everyone feel right at home. Last Saturday was my first night working there, and my magic was a huge hit, and I had a great time. Anyway, it's a terrific time, so come join in the fun! A few thoughts I had on attaining goals; inspired by my friend, Amy B. If you truly understand, and fully accept, that you are an idealistic person, it becomes increasingly easier to discern (and accept) when your ideal is unrealistic to the physical, emotional, and mental limitations surrounding its potential implementation. It doesn't mean that your ideal vision doesn't reflect "reality". It simply means that it is unlikely to manifest as a physical reality at this particular point in time. It also doesn't mean that some aspect of it can't manifest physically now, or that it might not be a realistic vision for future manifestation, which is, in point of fact where its true value lies. But it does allow you to more realistically weigh the risks involved in making the attempt and to proceed, or not, with a more accurate assessment of what the actual physical outcomes are likely to be. This understanding, and acceptance, of the paradox between ideal vision and material limitations allows you to make more effective choices of how you spend your time and energy. That being said, the true paradox is in those appropriate cases where, with full understanding of the limitations and the unlikelihood of manifestation, we nonetheless choose, with open eyes, to pursue the ideal as though there were no limitations. In those cases, even if we fail in attaining full manifestation of the ideal, as we most often do, we nonetheless often surprise ourselves with how much of it we are in fact able to manifest physically. Of course, this is only truly possible in those cases where we are not attached to any specific outcome, and where we are fully prepared to accept complete failure. Only infinite patience brings immediate results. But every significant accomplishment of mankind has begun with one or more idealistic visionaries whose ideal was completely unrealistic (from the perspective of the "current" physical reality) at the time of its imagining. Therein lies the paradox, and the frustration,... as well as the joy, of living in a physical world, with imperfect people and circumstances.